LEFT: Mount St. Francis St. John's, NLResidence of the Christian Brothers.From Benevolent Irish Society (St. John's, NL), Centenary volume, Benevolent Irish Societyof St. John's, NL, 1806-1906(Cork, Ireland: Guy & Co., 1906)p66. RIGHT: Mount St. Francis St. John's, NLResidence of the Christian Brothers.As it is today, 2018. The Brothers of the Mount Saint Francis Community have donated the core of their “Monastery” Library to Iona College. The gift, suggested by Brother J. Bertrand Darcy, was carried forward through an intensive cataloging and shipping collaboration involving Brothers Darcy, Gordon Raphael Bellows, Richard Fowler, Mr. Richard Palladino, Director of Iona Libraries, the Ryan Library Staff, Mr. Paul Sutera, Iona Vice President for Advancement, Casey DelliCarpini, Executive Assistant to the Senior Vice President for Advancement & External Affairs, and the Edmund Rice Christian Brothers Art Foundation. 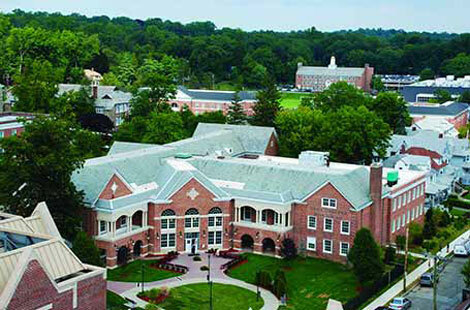 Ryan Library, Iona College, New Rochelle, NY. 2018. With publications and first editions dating back to the 1700’s, extensive representations of classics in literature, history and spirituality, the collection attests to the scholarship of the Brothers who have gathered these books since the founding of their initial St. John’s,Newfoundland community,in 1875. Brothers Darcy and Bellows had done research on the library, identified rare books and brought to the attention of Province Leadership the considerable value of the collection. Some of the Congregational Publications were integrated into the Archives of the Province;the rest were proposed as a gift to the Iona College Library to which Mr. Palladino responded with great enthusiasm. The books arrived in New Rochelle on June 15. Mr. Palladino indicated that a number of the works will be incorporated into the general collection;others will become part of the college archives and special collections including the College’s developing collection of publications related to Edmund Rice and the Christian Brothers.